The December 2018 close approach by the large, near-Earth asteroid 2003 SD220 has provided astronomers an outstanding opportunity to obtain detailed radar images of the surface and shape of the object and to improve the understanding of its orbit. The asteroid will fly safely past Earth on Saturday, Dec. 22, at a distance of about 1.8 million miles (2.9 million kilometers). This will be the asteroid's closest approach in more than 400 years and the closest until 2070, when the asteroid will safely approach Earth slightly closer. The radar images reveal an asteroid with a length of at least one mile (1.6 kilometers) and a shape similar to that of the exposed portion of a hippopotamus wading in a river. They were obtained Dec. 15-17 by coordinating the observations with NASA's 230-foot (70-meter) antenna at the Goldstone Deep Space Communications Complex in California, the National Science Foundation's 330-foot (100-meter) Green Bank Telescope in West Virginia and the Arecibo Observatory's 1,000-foot (305-meter) antenna in Puerto Rico. The Green Bank Telescope was the receiver for the powerful microwave signals transmitted by either Goldstone or the NASA-funded Arecibo planetary radar in what is known as a "bistatic radar configuration." 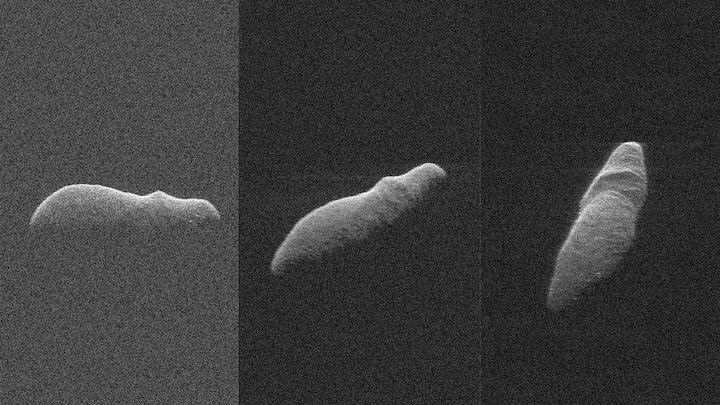 Using one telescope to transmit and another to receive can yield considerably more detail than would one telescope, and it is an invaluable technique to obtain radar images of closely approaching, slowly rotating asteroids like this one. "The radar images achieve an unprecedented level of detail and are comparable to those obtained from a spacecraft flyby," said Lance Benner of the Jet Propulsion Laboratory in Pasadena, California, and the scientist leading the observations from Goldstone. "The most conspicuous surface feature is a prominent ridge that appears to wrap partway around the asteroid near one end. The ridge extends about 330 feet [100 meters] above the surrounding terrain. Numerous small bright spots are visible in the data and may be reflections from boulders. The images also show a cluster of dark, circular features near the right edge that may be craters." The images confirm what was seen in earlier "light curve" measurements of sunlight reflected from the asteroid and from earlier radar images by Arecibo: 2003 SD220 has an extremely slow rotation period of roughly 12 days. It also has what seems to be a complex rotation somewhat analogous to a poorly thrown football. Known as "non-principal axis" rotation, it is uncommon among near-Earth asteroids, most of which spin about their shortest axis. With resolutions as fine as 12 feet (3.7 meters) per pixel, the detail of these images is 20 times finer than that obtained during the asteroid's previous close approach to Earth three years ago, which was at a greater distance. The new radar data will provide important constraints on the density distribution of the asteroid's interior - information that is available on very few near-Earth asteroids. "This year, with our knowledge about 2003 SD220's slow rotation, we were able to plan out a great sequence of radar images using the largest single-dish radio telescopes in the nation," said Patrick Taylor, senior scientist with Universities Space Research Association (USRA) at the Lunar and Planetary Institute (LPI) in Houston. "The new details we've uncovered, all the way down to 2003 SD220's geology, will let us reconstruct its shape and rotation state, as was done with Bennu, target of the OSIRIS-REx mission," said Edgard Rivera-Valentín, USRA scientist at LPI. "Detailed shape reconstruction lets us better understand how these small bodies formed and evolved over time." Patrick Taylor led the bistatic radar observations with Green Bank Observatory, home of the Green Bank Telescope, the world's largest fully steerable radio telescope. Rivera-Valentín will be leading the shape reconstruction of 2003 SD220 and led the Arecibo Observatory observations. Asteroid 2003 SD220 was discovered on Sept. 29, 2003, by astronomers at the Lowell Observatory Near-Earth-Object Search (LONEOS) in Flagstaff, Arizona - an early Near-Earth Object (NEO) survey project supported by NASA that is no longer in operation. It is classified as being a "potentially hazardous asteroid" because of its size and close approaches to Earth's orbit. However, these radar measurements further refine the understanding of 2003 SD220's orbit, confirming that it does not pose a future impact threat to Earth. The Arecibo, Goldstone and USRA planetary radar projects are funded through NASA's Near-Earth Object Observations Program within the Planetary Defense Coordination Office(PDCO), which manages the Agency's Planetary Defense Program. The Arecibo Observatory is a facility of the National Science Foundation operated under cooperative agreement by the University of Central Florida, Yang Enterprises and Universidad Metropolitana. GBO is a facility of the National Science Foundation, operated under a cooperative agreement by Associated Universities, Inc.
JPL hosts the Center for Near-Earth Object Studies (CNEOS) for NASA's Near-Earth Object Observations Program.